Good Stuff NW: A Bee, See? The other day I was invited to tag along as my neighbor, Mace Vaughan, Pollinator Program Director of The Xerces Society, inspected the hive at a nearby neighbor's home. 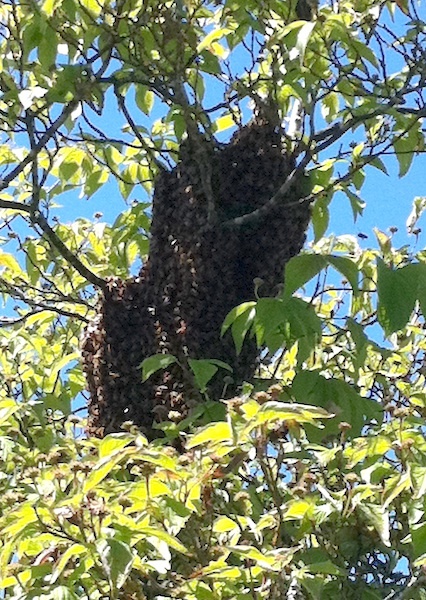 The hive had swarmed into a nearby tree (left) a couple of days before. Another box, or "super" in beekeeping terminology, had been added to give them more room, and Mace wanted to take a look. Mace's daughter came along and that's her you hear in the video. Note that the guys are just wearing hoods and veils, but no other protection and neither was stung. The bees completely ignored me, though I was standing nearby and wasn't protected at all. Fascinating!